Cornell Communications, the premier emergency and nurse call system manufacturer and developer, has over 40 years of experience in providing its clients with unbeatable customer service, unparalleled product ease-of-use, and unmatched emergency communication systems. Cornell's dedication to designing and manufacturing quality emergency communication products while exceeding customer’s needs has made Cornell Communications one of the best in the business, guaranteed. 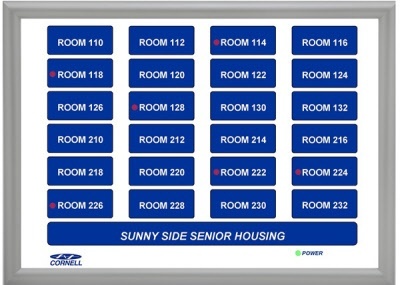 Ability to display 8, 12, 16, 24, or 48 rooms/zones with LEDs.